This article was written by Apoorva Maheshwari, a student of DES Law College, Pune. An ideal state is the one which safeguards individual liberty. 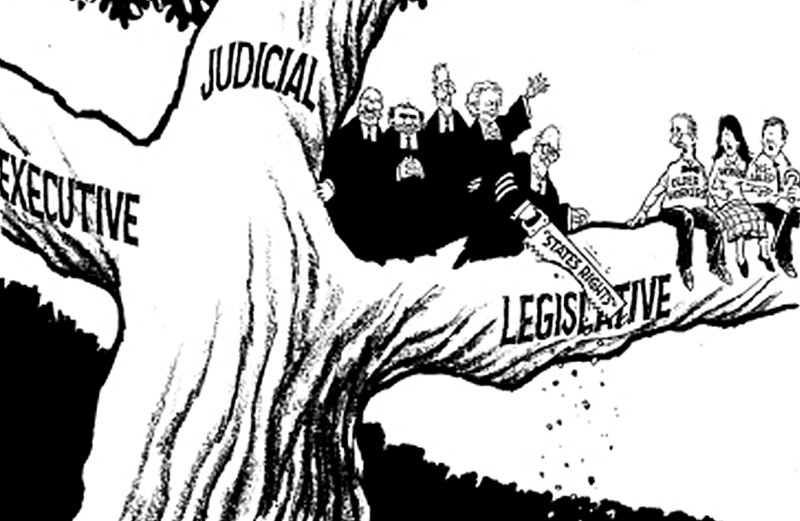 The need of separation of powers is not new but owes its existence since many years ago. The Social Contract Theory on the origin of state by John Locke paved way for separation of powers. Locke pleaded for separation of legislature from the executive. J.S. Mill, the English intellect, was the first person to plead for the liberty of the individual against legislative interference. Liberty can be protected only when power is not abused and power cannot be abused when a system of checks and balances exists. Concentration of power in the hands of a sole authority doesn’t yield in the betterment of the state as the sole ruling authority has greed of power in his malice stuck mind. James Madison was another scholar who in his Federalist paper no. 51 wrote about how to create institutions which would check personal ambition of one branch of government by the other because in his opinion, men are not angels and thus separation of powers is required. In India, the governmental power is divided between the three organs, namely, legislature, executive and judiciary. These organs are interlinked and their roles and functions tend to overlap with each other, as it isn’t possible to separate the three from each other completely. This has been the cause for not only serious political debate in the country but has also raised many philosophic and jurisprudential debates among legal scholars and the law fraternity. Whether there should be a complete separation of powers or a well co-ordinated system of distribution of powers thus becomes the focal point of contemplation. Therefore, this article emphasizes on the various pros and cons of the doctrine of separation of powers in India, analyses the difference between the theory and the real practice of the same and thereby gives the suggestions to imply the doctrine keeping in view the prevention of corruption and maintenance of public interest. The doctrine of separation of powers is a model for the governance of both democratic and federative states. This theory was first developed in ancient Greece and came into widespread use in the reign of Roman Republic as part of their uncodified Constitution. The same doctrine has also been a part of the marvels created by Plato and Aristotle. In the 16th and 17th centuries, French philosopher John Bodin and British politician Locke also expressed their views about it. But it was Montesquieu who for the first time formulated this doctrine systematically, scientifically and accurately in his book ‘Esprit des Lois’ (The Spirit of the Laws), published in the year 1748. In essence, Montesquieu lays down that it was in the nature of authority to abuse it and that unless clear limitations were laid down, arbitrary rule would be inevitable. According to him each power should be exercised by a different organ of government and among the various organs of government there should be a system of checks and balances so that one organ might not become all powerful. The separation of powers is based on the principle of trias politica. This Doctrine related to power, that owes its inception to the era of the ‘Magna Carta’, is the forerunner to all the constitutions of the world. Montesquieu’s belief of the formation of this theory as per the British constitution was negated when he learned about the fact that it was first introduced in America. The concept of Separation of Powers is a measure to protect individual’s rights, acknowledging the fact that governments have historically been the major violators of such rights. The hypothesis behind the Separation of Powers is that when a single person or group has a large amount of power, they can become treacherous to citizens. The Separation of Power is a method of removing the abuse of power. This doctrine envisages a tripartite system wherein power is distributed and delegated amongst Legislature, Executive and Judiciary thereby delineating the jurisdiction of each. Ending the despotism, it safeguards individual liberty. It emphasizes on the necessity of independence of judiciary. It not only maintains the efficiency in administration but also protects the people from the arbitrary rule of the executive. This theory admonishes the executive and the administrative wings of the government not to interfere with the process of law and justice, so as to ensure the liberty of the individuals in the society. Montesquieu had a feeling that his theory would be a panacea to good governance but it had its own drawbacks. A complete Separation of power without adequate checks and balances would have nullified any constitution. Absolute separation of powers would hinder in working of the organs of government with co-operation and harmony. Not only this, administrative efficiency cannot be attained if there is complete separation of powers because each organ would try to preserve its powers, neglecting the other organs. It was only with this in mind that the founding fathers of various constitutions have accepted this theory with modifications to make it relevant to the changing times. a.) The same person should not form part of more than one of the three organs (i.e. Executives, Legislature and Judiciary) of the Government. For example, ministers should not sit in Parliament. b.) One organ of the Government should not interfere with any other organ of the Government. c.) One organ of the Government should not exercise the functions assigned to any other organ. The authority of making laws is given solely to the legislature. It expresses the will of the State and the laws that it makes serve as a wagon to the sovereignty of the State. It is foundation for the working of the executive and the judiciary. It occupies the first place among the three organs of the government because the function of enforcing or interpreting the laws cannot be fulfilled until and unless they are not framed by the legislature. The judiciary can only suggest the legislature about the amendments of certain legislations or about framing of new laws but cannot frame them in actual sense. The executive is the administrative head of the government. It refers to that branch of the government which executes or enforces or carries out the will of the State as expressed by the legislature and the constituent assembly and as interpreted by the Courts. It is called as the ‘mainspring of government’ because when executive breaks down, the entire government collapses as it gets misbalanced. In a restricted sense, the term ‘executive’ includes the head of the State, his ministers, advisers and departmental heads. The term ‘judiciary’ is used to designate those officers of government whose function is to apply the existing law to individual cases by keeping in view standards of fairness and equanimity while applying the laws to individual cases. Lord Bryce says that “there is no better test of the excellence of a government than the efficiency of its judicial system.” It has been called as ‘the shield of innocence and safe-guardian of civil right’. Lord Bryce further says, “If the law be dishonestly administered, the salt has lost its flavour. If it is weakly or fitfully enforced the guarantee of order fails. If the lamp of justice goes out in darkness, how great is that darkness.” Judiciary, therefore, is one of the most vital branches of government as it is the guardian of the rights of the citizens. After the independence, Constituent Assembly was formed to make the Indian constitution. Our constitution was adopted on 26th November, 1949 and came into force on 26th January, 1950. Indian constitution discusses the federal system of the government at length along with relations between the government and people; political, social and economic issues; and relation between the executive, the legislature and the judiciary. When the constitution was first framed separation between the executive and the judiciary was adopted as directive principle of state policy. It means complete separation of powers between all three organs of the government was not included in the constitution in its absolute form. K.T. Shah proposed to incorporate this doctrine as an amendment under Art. 40-A in the Constitution but it was knowingly not accepted and as such dropped. Hence, apart from the directive principles laid down in Article 50 which enjoins separation of judiciary from the executive, the constitutional scheme does not embody any formalistic and dogmatic division of powers. Who are the executive, legislature and judiciary? India has a Parliamentary form of government- a system in which a clear division is made between the head of the state and a head of the government i.e. president is the head of state and prime minister is the head of government. In India, the executive is the President, the legislature includes Parliament- both the houses- Lok Sabha and Rajya Sabha and the judiciary contains Supreme Court of India and High courts of states and other subordinate courts. As India is a quasi-federal state- functions divided in centre & state- at centre level. The President is Executive and at state level, the Governor is executive. Similarly, every state has its state legislative body and at centre levels a Parliament. Though the doctrine of separation of powers is a part of the basic structure of the constitution but it’s not being followed strictly. As discussed above, there are three formulations of the concerned theory but in India, not a single formulation is being fulfilled. The very first formulation of the theory is that the same person should not form part of more than one of the three organs of the Government. But in India, Cabinet ministers of the government are the members of the legislature and are responsible to legislature. There is a clear link between the executive and the legislature because according to Indian constitution, cabinet of ministers form a part of Executive wing of the government. Secondly, one organ of the Government should not interfere with any other organ of the Government. But the constitution itself gives such authority to the different organs. For instance, it’s the main duty of the judiciary to protect the rights of individual and keep the rule of law in the nation but the other functions related to judiciary like- salaries, allowances and privileges of the Judges, their appointment and removal etc. are decided by the legislature. Further, the Supreme Court has power to declare void the laws passed by the legislature, if they are ultra vires to the constitution. The power to amend the constitution by Parliament is also subject to the scrutiny of the Supreme Court. At last, one organ of the Government should not exercise the functions assigned to any other organ. But in India, there is no absolute separation of functions in respect of organs. For example, judges are the subject matter of the judiciary but the allowances and other facilities are being decided by the legislature. Also, the president who has the executive authority exercises law-making power by way of issuing ordinances and judicial power under Art.123 and Art.213, subject to certain conditions. Not only this, though the legislature is the law-making branch but its laws can get validated only after getting the president’s assent to the same. “The Indian constitution has not indeed recognize the doctrine of separation of powering its absolute rigidity but the functions of the different parts or branches of the government have been sufficiently differentiated and consequently it can very well be said that our constitution does not contemplate assumption, by one organ or part of the state, of functions that essentially belong to another”. Secondly, the next issue is parliament’s action of putting legislation of its choice into ninth schedule- a concept adopted from the Irish Constitution, which prevents the court from passing judgments on them and Supreme Court has to accept it. This schedule involves subject who are far from everyday life but they are as important as any other fundamental right. All the legislation took place in ninth schedule through Art.31B of the constitution. Thus, Art.31B of the Constitution of India ensured that any law in the Ninth Schedule could not be challenged in courts and Government can rationalize its programme of social engineering by reforming land and agrarian laws. In other words, laws under Ninth Schedule are beyond the purview of judicial review even though they violate fundamental rights enshrined under part III of the Constitution. On the one hand considerable power was given to legislature under Article 31-B and on the other hand the power of judiciary was curtailed, this is the starting point of tussle between legislature and judiciary. However, the above provision was amended by the judgment of the Supreme Court. In I.R. Coelho vs. State of Tamil Nadu, S.C. took the opinion opined by the Supreme Court in Kesavananda Bharati case pertaining to the doctrine of basic structure and held that the Ninth Schedule is violative of the above said doctrine and hence from now on the Ninth Schedule will be amenable to judicial review which also forms part of the basic structure theory. The basic structure theory and the Golden triangle comprising of A.14, 19, and 21, will now be the criterion in scrutiny of the Ninth Schedule. Another issue that occurs is that there is constant tug of war going on between legislatures and judiciary. In many judgments Supreme Court cleared its view on the subject. Two things of great nature can be discussed here as a result of practice of separation of powers in a country- whether the separation is in absolute form or a partly separation of power like India. Here, issue of number of pending bills in the parliament can be considered. The rigid procedure of making or amending laws- proposal of bills, its discussion, majority opinion in its acceptance and after that consent of the President, takes too much time for passing any bill. The procedure of making laws has been divided between the legislature and the executive wing of the government. The bill comes to existence only when President gives consent, indeed there is a condition precedent. The separation of powers which is not absolute between the legislature and executive brings the number of pending bills. Total number of bills pending is 304 (270 of private members bills and 34 of government bills) till the thirteen session of the fourteen Lok Sabha. If we were having absolute separation and legislature would be the supreme authority to make laws then this problem can be sorted out though all the bills are not pending because of delay in consent given by the President but there are cases of that nature. The principle of independence of judiciary and separation of powers are necessary to study together because judiciary can get its independence only if there is a separation of power between three organs of the government. Independence of judiciary means a fair and neutral judicial system of a country which can afford to take its decision without any interference of the executive or the legislative branch of the government. It means that the judges are in a position to render justice in accordance with their oath of office and only in accordance with their own sense of justice without submitting to any kind of pressure or influence. According to Merriam-Webster’s Dictionary of Law, judicial activism is “the practice in the judiciary of protecting or expanding individual rights through decisions that depart from established precedent or are independent of or in opposition to supposed constitutional or legislative intent”. Judicial Activism is possible at present time only because there is a separation of power by which the judiciary has been given independent and separate nature. Judicial activism means that the judiciary, under the guise of interpreting the law, goes a step beyond, and ends up giving the country new binding law, which is usually different from the existing one. This most celebrated term has its own best and worst characteristics. In the modern world, such activism is necessary. It is good or bad will differentiate as per the facts of the cases. In the cases like Ashok Hurra v. Rupa Bipin Zaveri, practice of judges has been considered as a part of so called judicial activism. The line between judicial activism and judicial overreach is very narrow. When judicial activism crosses its limits and becomes judicial adventurism, it is known as Judicial Overreach. When the judiciary oversteps the powers given to it, it may interfere with the proper functioning of the legislative or executive organs of government, thereby destroying the spirit of separation of powers. There have been many instances when the judiciary has surpassed its area of authority and therefore disturbed the separation of powers. For example, the Supreme Court struck down on the National Judicial Appointments Commission (NJAC) law meant to replace the two-decade old collegiums system of judges appointing the judges in higher judiciary. A bench of five judges of the SC held the 99th Constitutional Amendment Act and the NJAC Act 2014 “unconstitutional and void”, though it got passed in both the Houses of Parliament and received the President’s assent too. But the five judge bench held that executive involvement in the appointment of judges impinges upon the independence of judiciary and thus violates the doctrine of separation of powers. The bench struck down on the government’s arguments that the question of validity of the NJAC and the 99th Constitutional Amendment should be referred to a larger Bench in light of the two ‘Judges Cases of 1993 and 1998. The SC rejected the plea of Centre that the petition challenging NJAC Act be referred to a larger Bench. The next example can be cited of the recent BCCI case. The Supreme Court’s action against the BCCI is a case of judicial overreach because the court has gone out of its jurisdiction to take the action. It is not for the court to run a sports body or to prescribe how it should be run. It is not disputed that sports bodies, like all other bodies, should have transparency and accountability. The functioning of the BCCI needed to improve also. But the court should not take that responsibility on itself. The judiciary has a specific role assigned to it by the Constitution. It should not encroach into the areas of the executive and the legislature. There is wisdom in not doing what should not be done as much as in taking the right action where it is needed. From the above observations, examples and case laws, it is quite evident that the doctrine of separation of powers is only structural and not functional in India. Though the doctrine has been accepted as the part of the basic structure of the Constitution by the Apex Court despite of not being exclusively mentioned in the Constitution, it is still not practised in its true spirit. It is agreed that the policy of separation of powers cannot be fully executed in its rigidity because of the needs of the vast and diverse population in our country. But it certainly can be practised in a modified form so as to avoid corruption and tyranny of any one organ of the government. The modified form includes the division of the three branches structurally as well as functionally so that any of the branches doesn’t act beyond the scope of its authority except in case of emergency or application of checks and balances to prevent despotism. Here, some important suggestions can be brought into light as preventive measures for tyranny. Further, judicial restraint is important because judiciary is not accountable to any other branch or any other authority. The executive actions are subject to judicial review if there is any departure from the rule of law by their actions. The laws passed by the legislature can also be declared void if they are beyond Constitutional bounds. But when Judiciary is guilty of excesses, it is only subject to public criticism or a larger Bench or a constitutional amendment can intervene. Hence, judicial restraint is significant. The next suggestion can be seen whereby the task of the court should be to compel the authorities to act and to pass appropriate executive orders rather than substitute judicial orders for administrative ones. They must be told how their duties are to be properly discharged and then commanded to do so. For, this they must be held accountable to do so. Hence, there should be answerability of the executive for the actions taken by them as directed by the judiciary. Also, the legislature should not act as a passive spectator of the judicial orders, rather it should be active and quick in making the required laws or amending the existing laws as directed by the judiciary so that the judiciary doesn’t act as a super legislature and prevention of interference by the judiciary can be achieved. The last suggestion is that the executive should work in the enforcement of laws actively. Its duties should be defined and its actions should be accountable. The President’s assent is the reason for a number of pending bills in our country, hence this lethargic attitude should be checked. History has been the witness that concentration of power in the hands of one might have conquered a number of wraths but never did such autocrat get success in achieving public faith. Therefore, the doctrine of Montesquieu is not merely a myth it also carries a truth, but in the sense that each organ of the Government should exercise its power on the principle of Checks and Balances signifying the fact that none of the organs of Government should usurp the essential functions of the other organs. In today’s environment this doctrine should be exercised in the manner in which the best interest of the citizens can be achieved. The rights of the individuals are the arrows of the bow called the power of the authority. What the power intends, the delegates follow and the men attain. The power is a failure until not divided. The balance shall exist in order to save the state from its doomed wrath.